The small town of Nosara is located on the west side of the Nicoya Peninsula in Costa Rica. Together with Guiones, Pelada and Ostonial, Nosara forms the Ostional Wildlife Refuge. The coast of the area is surrounded by gentle hills covered by tropical dry forest which are home to a wide variety of animals. You can spot exotic birds, monkeys, coatis, armadillos, raccoons, squirrels, crocodiles and many more. 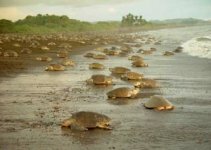 And thousands of Olive Ridley turtles come to Ostional Beach every year for nesting as well. Getting to to Nosara is quite difficult as there are no paved roads. The best way to get here is by taking a flight from San Jose or Liberia to the Nosara Airport. Nosara offers all basic services such as a school, post office, clinic and different shops. There are accommodations for every taste and budget and most of the hotels are built in a way they do not interfere with the environment. This area offers a lot of attractions and activities that combines adventure, beauty and nature. Nosara has a dark sand beach and it is located north of the Nosara River's mouth. The surfing and the deep sea fishing here are exceptional and the beach has been considered one of Costa Rica's most diverse ecological environments. It is definitely a good spot to observe wildlife and plants. Visitors can ride a horse to the close-by mountains, go snorkeling in the warm waters of the Pacific Ocean or just go swimming in the sea and relax. Pelada Beach has white sand and it is considered one of the most beautiful beaches of the country. During low tide some pools appear in the rocks along the beach, where multicolored fish can be easily observed. There are also caves in the rock, caused by the erosion of the waves during centuries, creating unique scenery. Guiones is a long, narrow beach of white sand, considered the best place in the central Pacific coast to practice surfing.